Earlier today, Rockhopper made two visits on the server Blizzard, which is probably (but not definitely) his final visit this month. Rockhopper played games such as Hide and Seek, told jokes, explored the island, told a story about a snowman and more! He did not have a new background, but his visit was still very enjoyable. This visit, along with many of the rooms, was also tracked by the Rockhopper tracker. Thank you very much for reading, the Puffle Party is due to begin tomorrow and PH will visit from then! 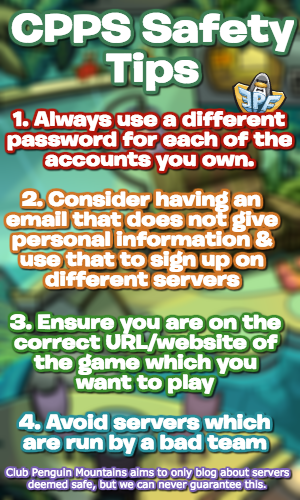 Rockhopper made an appearance on the servers Blizzard and Sleet today, playing lots of games and exploring the island! Although he did not have a new background, his visit was still extremely fun as he told lots of jokes, participated in many activities and more! Although he offers a stamp, his background was not new. This visit was also tracked by the Rockhopper Tracker, along with rooms, so be sure to check that! Good luck meeting Rockhopper soon if you’ve not yet met him! Rockhopper made an appearance on two servers today, both Beanie and Blizzard, offering an exclusive background and stamp! Whilst he did not have a new background since his one at the Waddle on Party, he explored the island, played many games such as Hide and Seek, told several jokes and stories and much more! 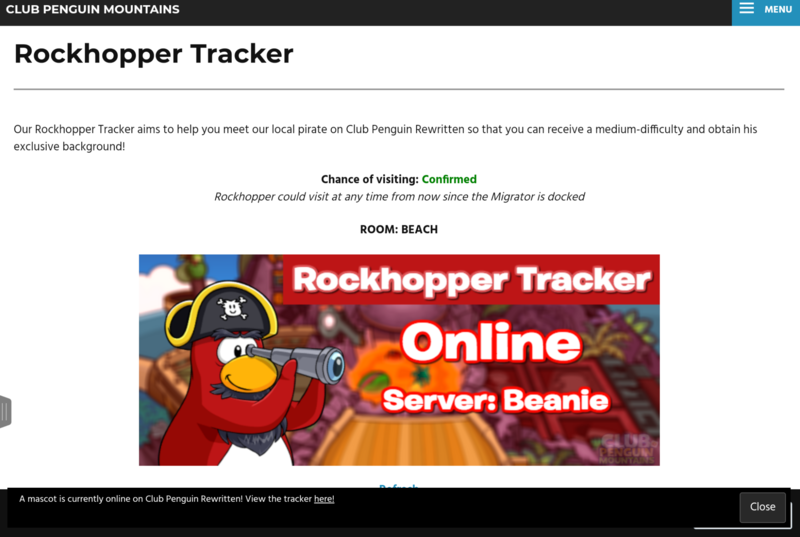 The visits on both servers were tracked by the Rockhopper tracker, along with the room, and you can see proof of that here. 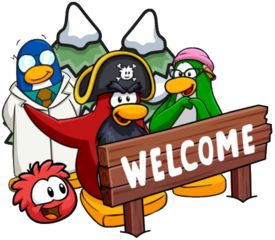 Thank you very much for reading, good luck meeting Rockhopper next time if you missed him! Everyone can receive a pair of Pirate Boots for free, or purchase the Tricorn Hat for 250 coins or the Sailor’s Shirt for 150 coins! There is also a furniture item which is the Porthole, and they cost 160 coins each. There are no secrets here. Along with this, the Notice Board has returned, but sadly you can’t view anything. There haven’t been any noticeable updates to this area either. Treasure Hunt has not been added yet, however the team revealed that they are working on adding it! It isn’t exactly confirmed whether it will mean that we can play Treasure Hunt whilst the Migrator is currently docked, or if we will have to wait a few months. That concludes everything on the Migrator, though there are many cool decorations across the ship to explore! Since the Migrator is docked, Rockhopper will also be visiting the island, and you can view a tracker for him here. It’s official! Rockhopper has begun waddling around the island! Stu uploaded a video yesterday, showing his first meet-up on the server Arctic. I was lucky enough to be able to meet him there too! This meet-up reminded me of when I met Rockhopper for the first time and that was just by chance. It’s amazing how quickly a mascot can fill up the server and pretty nostalgic too! By meeting him, you will obtain his stamp and be able to receive his background! Good luck catching him around the island, hopefully he will be on a few more times then mascots at the Music Jam.